The Boston Marathon, one of the most anticipated events of the year, is finally almost here. 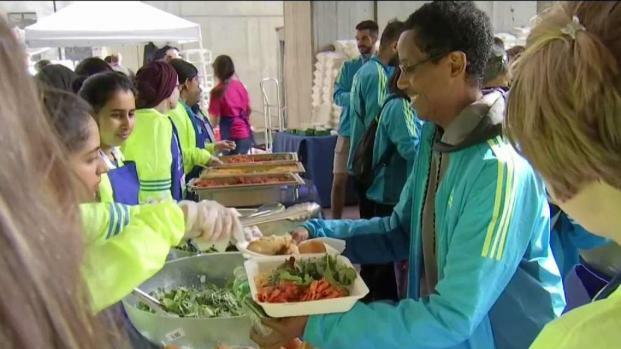 Hundreds of runners descended upon City Hall for a pasta dinner to fuel up for the big race and mingle with other participants on Sunday evening. A great way to calm those pre-race jitters. Tendai Muskikavanhu once weighed 300 pounds and was unable to run from the kitchen to the driveway. Now, he is running his second Boston Marathon, but not in vain. He has raised $25,000 for A Better Chance. "It's a leadership program that fights for children of color that typically are in neighborhoods where the schooling may not be as great," he said. 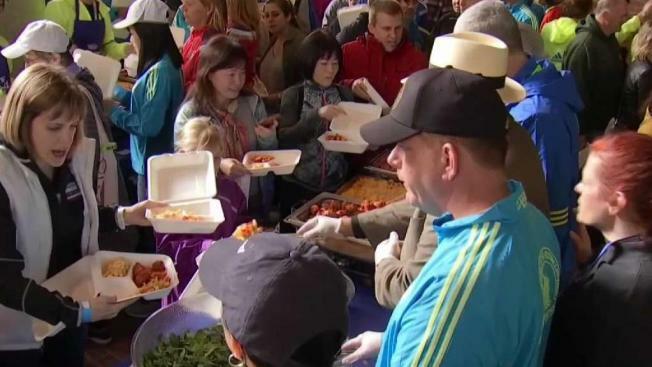 Runners head to Boston's City Hall for a pasta dinner the night before the 123rd Boston Marathon. These runners have put in hours each week for months to get ready for this day. Some, like Muskikavanhu, raised thousands of dollars for Boston Marathon charities between training. One major obstacle every year is waiting to see what the weather will be like on the day of the run. Last year was cold and rainy, to put it nicely. Some rain is expected for this year's race, but it won't be nearly as bad as last year. "I'm from Minnesota, so I'm used to all the conditions," Charlie Lonergan, a former brain tumor patient who is running the marathon, said. "We're coming from Britain. We are so used to this weather," runner Simon Prytherch said. The Boston Marathon is always a historical race, from the screaming tunnel in Wellesley to heartbreak hill and seeing the Citgo sign as you enter the home stretch. Official estimates predict over 30,000 runners will participate in the marathon, and $30 million will be raised through charities. 2019 is the first year that the Boston Marathon falls on One Boston Day, a day when all members of the community are encouraged to perform an act of kindness and reflect on the tragic events of April 15, 2013. "I really believe the Boston bombing has shown that just as much as there is darkness there is light. This city is strong and this city will never cower," Muskikavanhu said. Police Commissioner William Gross said federal, state and local first responders are all ready along the route. "I'll be up all night, that's why I have reserves," Gross said. The first race, the men's wheelchair division, kicks off at 9:02 a.m. The ladies start two minutes after that. The elite women's race begins at 9:32 a.m. and the elite men's begins at 10 a.m. Wave one takes off soon after.